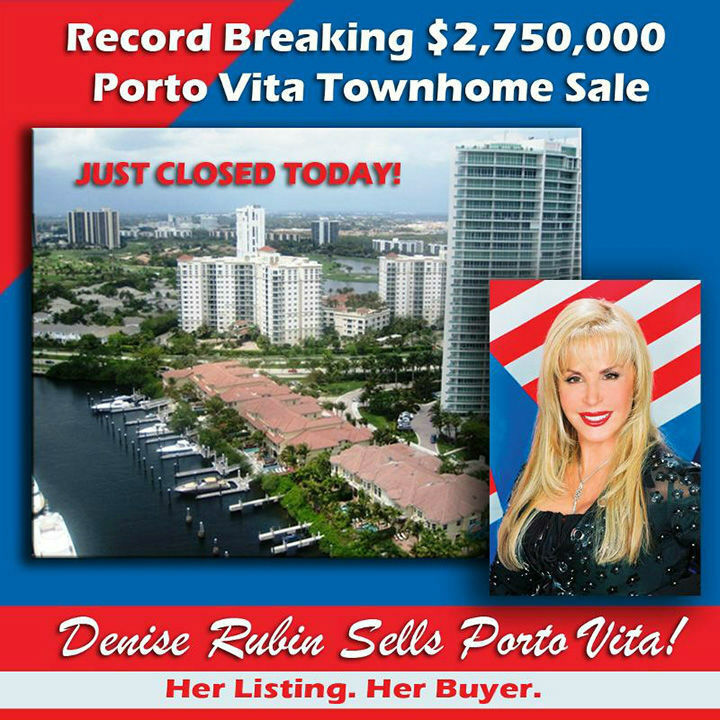 PORTO VITA 2801: SOLD for the highest price per square foot in the history of Aventura! $812 a square foot! $4,171,500 Total Price! 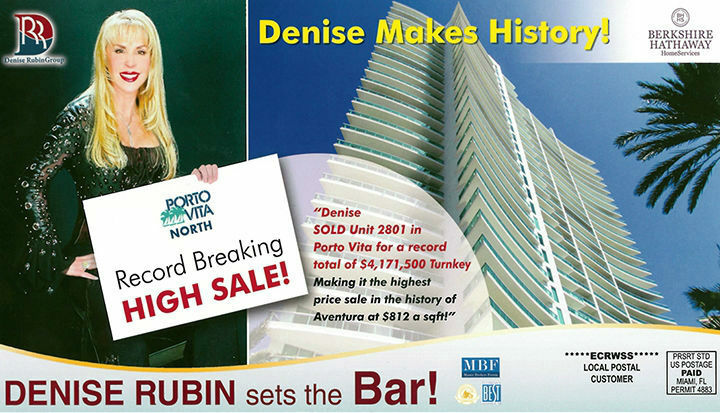 PENINSULA 2505: SOLD a 2 bedroom unit for the record breaking price of $1,200,000! HAMPTONS SOUTH 2506: Another SALE another record broken! Most expensive 2 bedroom unit $1,100,000! Under contract in 25 days! HIDDEN BAY 1413: Listed for $864,000 and SOLD for $864,000 in original condition! PORTO VITA: This Porto Vita town home was listed with other realtors for 4 years! 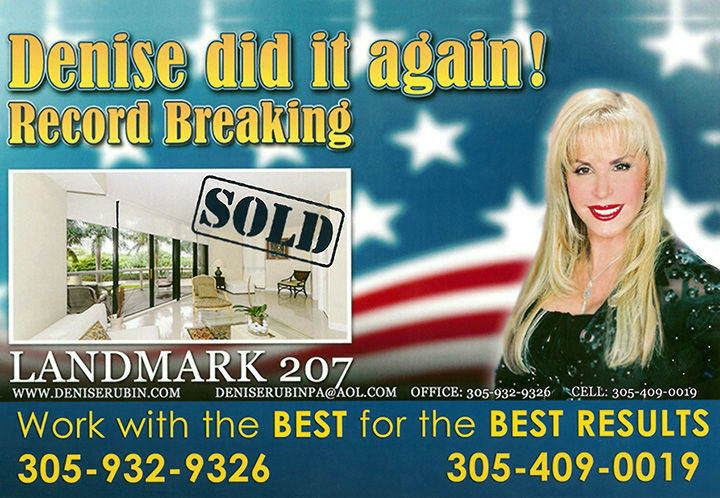 Denise got it under contract in only 3 months. $623 per square foot, total sale $2,750,000. OCEAN 3 #1405 (SUNNY ISLES): SOLD for an amazing record breaking sale price of $1,390,000. Highest for that line in 2 years! PORTOFINO TOWERS #3606: SOLD this 06 line for $2,000,000! That’s $980 per square foot; the average price is $600 per square foot. 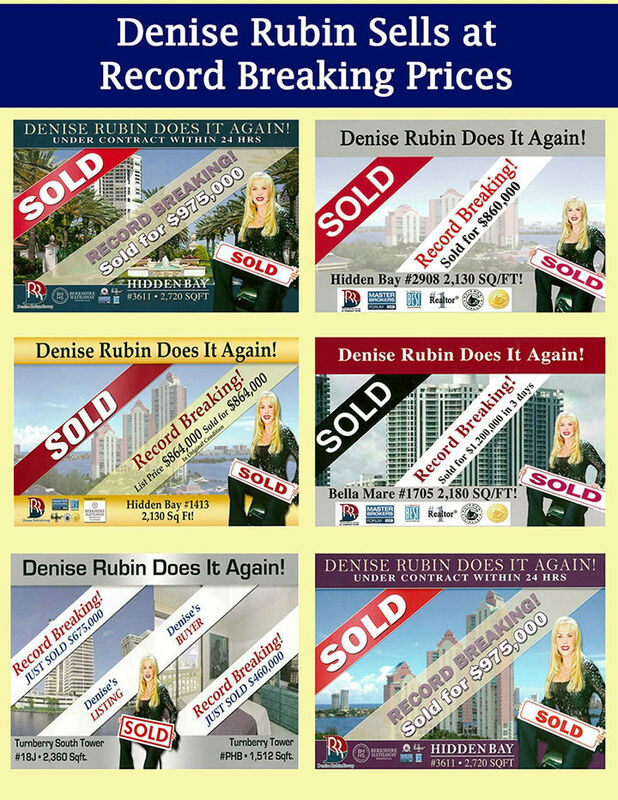 TURNBERRY ISLE: Three record breaking sales! TS-3 $936,000, 22J $625,000 and 21k 2 bedroom full price $468,000. HIDDEN BAY #2206: Sold for $620,000 which is 100k higher than the last best sale for an E unit. BELLA MARE 2407: SOLD for $1,250,000 in 60 days! CASH! PORTOFINO: SOLD a 06 Line at Portofino for $2,000,000! 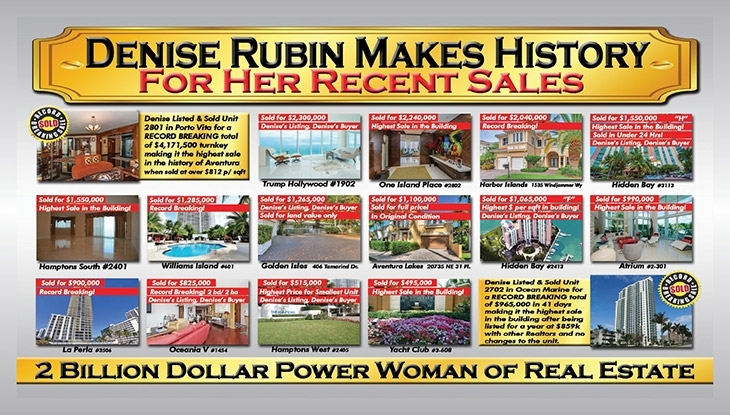 The upgraded unit she sold was appraised at $1,500,000 but she got it sold for $500,000 above appraisal! A unit six floors below just got an equity line and it was appraised for $1,050,000. ISLAND WAY: SOLD home on a dry lot for the highest price in the community in the past 2 years! BELLINI: Leased unit #1401 for the highest price in the building ever! $13,000 per month! HIDDEN BAY 1805: SOLD for the highest price in 2010! Was listed with prior realtor for 2 years! 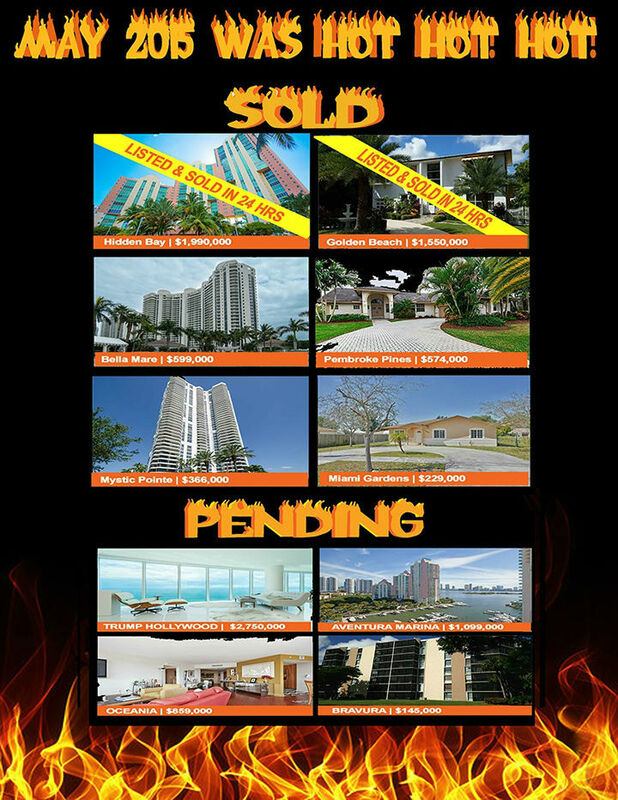 TROPICANA 604 (SUNNY ISLES): SOLD unit in 2010 for the highest price in the history of the building. TERRACES OF TURNBERRY: SOLD a unit for the highest price in the building in the last 3 years! HARBOR ISLAND: SOLD a home on Hatteras Lane for the highest price in 2010! $1,950,000 (furnished), from contract to close in 5 days! PENINSULA 1: SOLD unit 2908 for the highest price in 2010 and 2011 in 9 days $1,300,000! The average price of this building $211/sqft, Denise got $360/sqft!